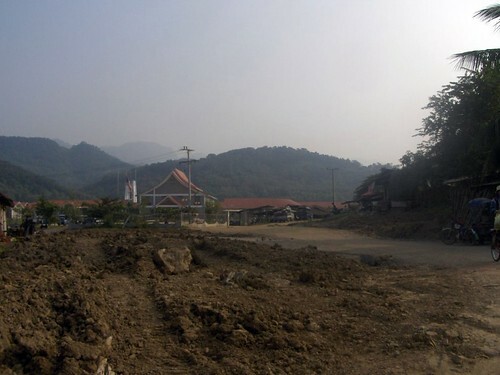 I arrived in Luang Prabang and promptly got sick. I woke up my first morning there with a runny nose, headache and fever; nauseous, shivering and generally just feeling awful. I felt like I had the flu. And normally I’d just sleep that off for a day, drinking lots of orange juice and watching soap operas, maybe asking my mommy to make me some chicken noodle soup. But I was in Laos, land of scary diseases like Malaria, Dengue Fever and Japanese Encephalitis, all of whose symptoms my guidebook lists as “high fever, nausea and headache”, with the added warning that any sign of fever should be treated immediately because malaria needs to be caught in the first 24 hours. And to make things worse, there are no reputable hospitals in Laos—any major emergency medical cases need to be flown to Bangkok for treatment. Anyway, I’m not normally prone to hypochondria, but I got myself worried. So I dragged myself out of my guesthouse that afternoon and wandered the streets slowly and stumblingly, sweating profusely, trying to find someone who could tell me where to find an English-speaking doctor. This took a few hours… when you don’t need any help you’re constantly being badgered by people wanting to sell you things, or give you massages, or rides on their motorbikes, but when you actually need something (and look a little diseased) nobody approaches you. Plus every tuk-tuk driver in the world knows the english words for the main tourist attractions, and for denominations of money, but if you say “take me to a doctor” they just stare back blankly. I found a place listed in the Lonely Planet as an “international clinic” but nobody there could understand anything I said. They just laughed at the amusingly-bearded American (i realized later I had stumbled in to the cardiology department by mistake). The China-Laos Friendship Hospital. If there are three words you shouldn’t trust when found in a sentence together, they are China, Laos, and Hospital. And if it looks like it’s in the middle of a big muddy field, that’s because it is. 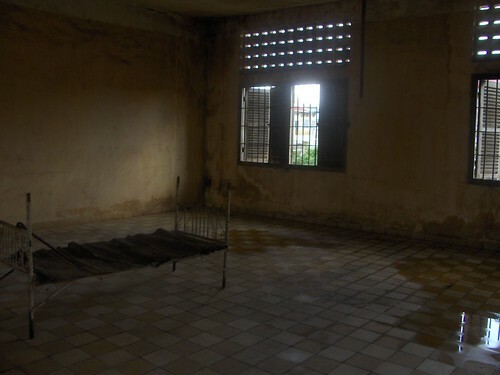 That’s actually a picture of a prison cell at the Phnom Penh Genocide Museum—I didn’t take any pictures inside the hospital. And I’m exaggerating a bit with that picture, but the hospital bed was about the same… small and uncomfortable with a thin mattress stained with countless laotian bodily fluids. Seriously it looked like the sheets had never been washed. The whole room was dirty and full of medieval torture device-style instruments. None of your typical western white-washed antiseptic hospital rooms to be found here. So the doctor laid me down, and the nurses took my temperature (101! ), and my blood pressure, and listened to my chest and all that. And then they all went away and left me for a while wondering what was going to happen to me. Did I have malaria? Were they going to come back with foreceps and leaches? Would I have to evacuate myself to Bangkok? But the doctor came back and announced I just had a common cold. And I should sleep, and drink fluids (though presumably not orange juice). He gave me some decongestant and cough drops and sent me on my way. So I was relieved, but still spent the next couple days lying around in my guesthouse room feeling sorry for myself. And eventually I felt well enough to go out and enjoy Luang Prabang. But more on that in subsequent posts. Lesson Summary: It’s no fun to be sick when traveling alone. And dont ever get seriously sick in Laos. And I miss orange juice a lot.